If you're a regular reader of my blog, you'll know that I love BB creams and opt for them over a foundation for an everyday make up look. I've been using the Garnier BB Cream Miracle Skin Perfector for the past year and have purchased 3 tubes of it. However, recently I've been getting a bit fed up with it so decided to try a new one. 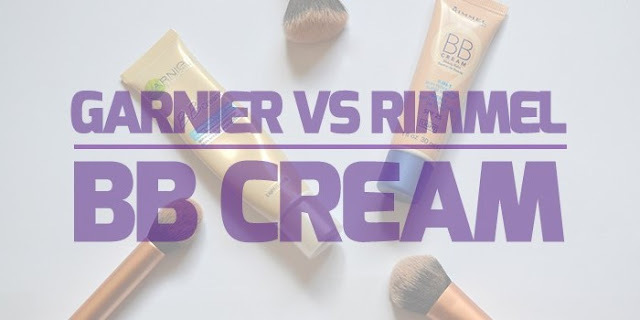 I had a look at a few in Boots the other week and after much swatching, I decided to buy the Rimmel BB Cream 9 in 1 Make up, so how do they compare? The Garnier one is a lot more liquidy and runny, which leaves a dewy look. In comparison, the one from Rimmel is a lot thicker which leaves a matte finish which I actually prefer. However, I have found that this because Rimmel's BB Cream is thicker, I find it a little harder to blend. Both offer great coverage with only a relatively small amount of product, however, I have found that I need more of the Rimmel cream to provide me with my desired coverage. This is because it's more dense than the Garnier one so doesn't blend as well. One of the things that prompted me to change my BB cream is that I was getting fed up with the way the Garnier cream would go patchy on my face towards the end of the day. However,whilst at first I was pleased with how well the Rimmel BB cream lasted, the more I wear it, the more I realise it's not great at lasting long either. I'm not sure if this is the nature of BB cream or if I've yet to find one that lasts all day. The Rimmel BB cream is a lot cheaper at £4.99, whereas the Garneir cream is £9.99. If this is a big factor in determining which product you would go for, I would definitely recommend the Rimmel product. The Garnier BB cream has more of a peach undertone and even the lightest shade is still a little dark for me. In comparison, the Rimmel product has more of a yellow undertone which is much more suited to my skin tone and caters much better for the lighter skin tone. Despite, loving Garnier BB cream for the past year or so, I must admit I am moving more towards the Rimmel cream at the moment. Have you used a BB cream? What's your favourite? Let me know in the comments. I used to use the Garnier BB cream that contains Salicylic acid because my skin is very blemish prone, but even that lightest shade is way too dark for me - I guess that's the same with all of their BB creams then! I like the sound of the Rimmel one, but I think the best BB cream I've tried is the Tea Tree one from The Body Shop! I have the Rimmel BB cream 9 in one and absolutely love it..I don't like foundations as they are too heavy but this BB cream is beautiful..has a great finish with just a hint of glow..love this ..will definitely buy it again..I just hope they never change it.